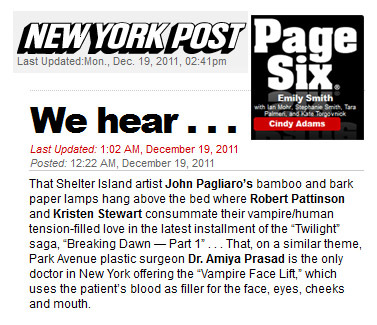 That Shelter Island artist John Pagliaro’s bamboo and bark paper lamps hang above the bed where Robert Pattinson and Kristen Stewart consummate their vampire/human tension-filled love in the latest installment of the “Twilight” saga, “Breaking Dawn — Part 1” . . . That, on a similar theme, Park Avenue plastic surgeon Dr. Amiya Prasadis the only doctor in New York offering the “Vampire Face Lift,” which uses the patient’s blood as filler for the face, eyes, cheeks and mouth. The Vampire FaceLift® Procedure™ combines the science of hyaluronic acid fillers (i.e., Restylane and Juvederm), unipotent stem cells, and beauty to provide a custom designer procedure.